Wales Trip---Litter-Picking "Births" New Church! "Are you going on the Convoy of Hope missions trip to Wales?" This was asked of me by a couple from our church, First Assembly of God, San Antonio, TX, on a Sunday while in the same restaurant for lunch. We were entertaining a group of Foreign Military Officers as is our custom each Sunday after taking them to church, and I had stepped over to this couple's table to greet them. My answer was, "No, I guess not since there are no finances for it at this time." They said, "How about if we give you $400 'seed-money' to get you started?" Three months before on a Sunday morning, when Pastor Wayne Clark announced the planned missions trip to Wales in the United Kingdom and asked for volunteers, I thought my heart was going to pop out of my chest!! It seemed the Lord gave me such a desperate desire to go on that trip! Dave and I have been appointed missionaries with the Assemblies of God for 38 years, working in seven nations in Africa and Europe----but never had I felt the urgency to answer "the call" such as I felt that Sunday morning after the Wales trip announcement, working with Convoy of Hope. On the way that same Sunday night to our church service, I spoke with my husband about the possibility of making up the difference apart from the $400 for my ticket. He said "Honey, don't count on it---it just isn't going to happen". At that point, I told the Lord from the quiet of my heart that if this trip was going to happen for me, it was going to be HIM Who was going to make it happen! Again, that same evening, after church, another couple asked me if I was going on the Wales missions trip. I told them it didn't look like it, although I had a promise of $400 "seed money". He asked me how much I needed and I replied I thought it would be about $1600. He whipped out his check book and wrote me a check for $2,000! WOW! It blew me away! I started crying and hollaring all at the same time---"Pastor, I'm going to Wales!" I knew then for sure that God DID mean for me to go! The next week, when the first couple gave me their "seed money" check, it was for $600 instead of $400! Since then, I found out the tickets were actually $1,750 instead of what I thought to be $2,000 each. So, then I had $850 more than I needed! So I called Pastor to see what the chances would be if my daughter, who is the wife of an ordained pastor in Oregon, was able to use that extra money toward a ticket. She was raised on the mission field and I knew it would be exciting for her to get to be involved in missions as an adult AND that we could have this experience together. Then it was the question---"How to get her to San Antonio, TX, from Portland, OR, to meet up with the team." She sent out letters to friends explaining her need and a response came from her close friend who offered to pay for her round fare ticket---then asked, "Do you think I could go too?" Well, more finances came into the church so Dawn's ticket was fully funded and she and her friend, Fran, joined the team of 18 others! God chose the team! Many of us had to have a miracle in order to make this trip, and it was God coming through at the last moment, providing funds or passports that made us know He was in control! Our team had such unity of mission and passion! Has it ever happened before that a new church was born through a team traveling thousands of miles to pick up trash in the streets? Or that they distributed 2,500 bags of food (42,000 lbs) to children and families in poverty-stricken areas? Or that they cut down brambles, weeds and thistles around a traffic circle where thousands of cars pass daily going to work, asking us what we were doing it for? Or that we worked in the yard of a home for battered women, building a playground, did some landscaping and repaired and painted the fences? 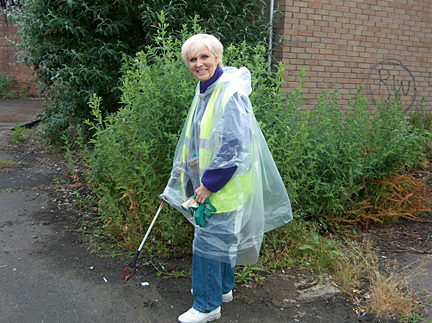 The Welsh were amazed that Americans would come so far to pick up their trash, paint, cut down their weeds and pass ou 2,500 bags of groceries! Why would we do that??? Aha! We got their attention! Then we could tell them that we were having a big party on Saturday in an open field (in conjunction with the local Assembly of God church), where there would be all sorts of fun entertainment for the families---everything from face-painting, wall climbing, karate demonstrations, a famous local rugby player, music, a whole roasted pig for sandwiches, and much more. For four hours we mingled and talked with an estimated one thousand people, inviting them to the first church service in their neighborhood the next morning. We showered these visitors with love and embraces, just letting them see the joy in our lives! In Europe today, religion is a lost part of peoples lives! Church is considered irrelevant in today's modern society. Only old people and children "need" church! We did not meet people on the streets with a "God bless you!" We did not talk about Jesus! Instead, we did our best to BE Jesus to them! The next morning at the first service in that neighborhood, we had an estimated 300 people present! Of course, some of those were the team members and some of the local church members who came to help with the serivce. But, the next Sunday after the team had left, it was reported that the New Life West Church had 80 in attendance! We are grateful to and thank the Lord for that number! We believe a new church was truly born out of our picking up litter in the streets and cutting down the brambles! There is always a way to get attention to let people see Jesus! As I already mentioned, Dave and I have spent 38 years in missions! Never have we been in a situation where we couldn't talk openly about the Lord in order to see people readily accept our message---but we now see how times have changed. We have to win people to ourselves by our actions before we can be a witness with our words. It works! Picking up litter isn't all that bad! We were on a mission---and it worked! So what next, Lord? I am ready to go---again!